Bosnia isn’t a country which has much positive associated with it – war, tragedy and death seem to be the ideas most people seem to associate it with, writes James Doe. The conflict which wreaked havoc in the country between 1992-95 was an awful chapter in the region’s history and should never be forgotten but it ended 16 years ago and apart from a pretty dire political stalemate (the country is effectively divided in two between Muslims and Croats on one side and Serbs on the other) it is now a largely safe, cheap and very enjoyable place to visit. A trip to Bosnia has been on my list for several years but I’d never quite got round to it so with a bit of time and some post-BBC redundancy money, my wife and I finally booked the flights and headed off. 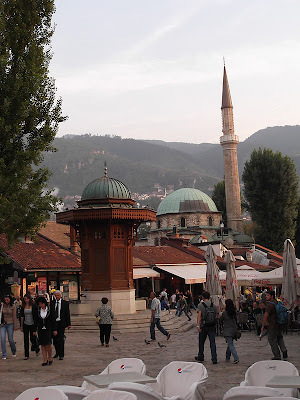 Sarajevo is unlike any European capital city I have visited. Its architecture is a real mixture of Ottoman, Viennese and Communist styles. Many buildings bear the scars of the relentless shelling of the recent conflict but this only adds to its character. To top it all, it is surrounded by towering mountains which make for some breathtaking views. Having spent a week seeing the sights of Sarajevo and also visiting Srebrenica, Mostar and Travnik we decided to spend the last night of our trip at the 12,000 capacity Grbavica Stadium watching FK Željezničar host Sloboda Tuzla. 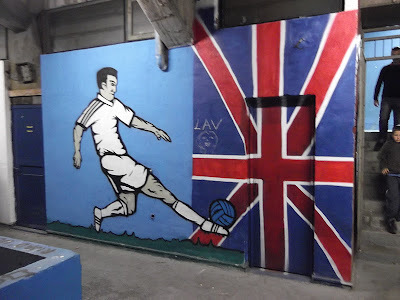 Formed in 1921, the ‘Railwaymen’ are one of two big clubs in town (there are other smaller ones too) and are located south of the river whilst rivals FK Sarajevo occupy the former 1984 Winter Olympic Stadium on the north side. The last couple of years have been pretty successful for Željo having won the Bosnian Premier League (2009/10) and Bosnian Cup (2010/11) and after a slightly indifferent start to this campaign, a run of four straight wins in the league and cup saw them come into this game in good form. Sloboda, by comparison, are an older club (1919) but have a much more modest record and have yet to win any domestic honours. Having lost the majority of their games this season, it looked like this was set to continue. 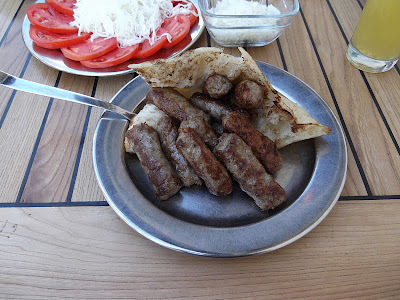 Fuelled up on the local delicacy ‘Ćevapi’ (a kebab-style dish consisting of bread stuffed with around 10 small beef sausages), getting to the Grbavica neighbourhood from the main tourist area was easy with the tram dropping us off a short walk from the ground. The buildings on the approach to it are mainly residential blocks which appear to have received a lot of attention from the Bosnian Serb artillery during the war. Being close to the front line, the stadium itself took a lot of punishment too with the wooden terraces being burned but there’s little evidence of it now. On arrival at the ground, there was no obvious sign of a ticket office. After getting the information from a steward (and nearly poking out a supporters’ eye as I swung my arm out to verify my instructions – a heartstopping moment), I made for a hut at the intersection of the North and West stands. Despite my lack of Bosnian and anything like the correct change, I managed to get two tickets for the North Stand behind the goal with relative ease and for a total of just 16 marks (£7). Having timed our run to the ground pretty late, most of the good seats had already gone. Not wanting to stand out too much as tourists we swiftly made our way down to the front only to find virtually every seat was covered in bird droppings. Željo fans in the North Stand (i.e. not ultras) are often referred to as the ‘seed eaters’ because they often munch through loads of them as they watch the game – afterwards the birds fly in for the leftovers and leave a little something behind themselves. Finding seats with minimal soiling we sat down and hoped for the best. The game got under way at sunset to the sound of the Islamic call to prayer from a nearby mosque but apart from that there was little noise. Whether this was out of respect (Sarajevo’s population is estimated to be 70-80% Muslim) or the fans were just slow to get going was unclear. The lack of any obvious away support also ensured the atmosphere took time to develop. 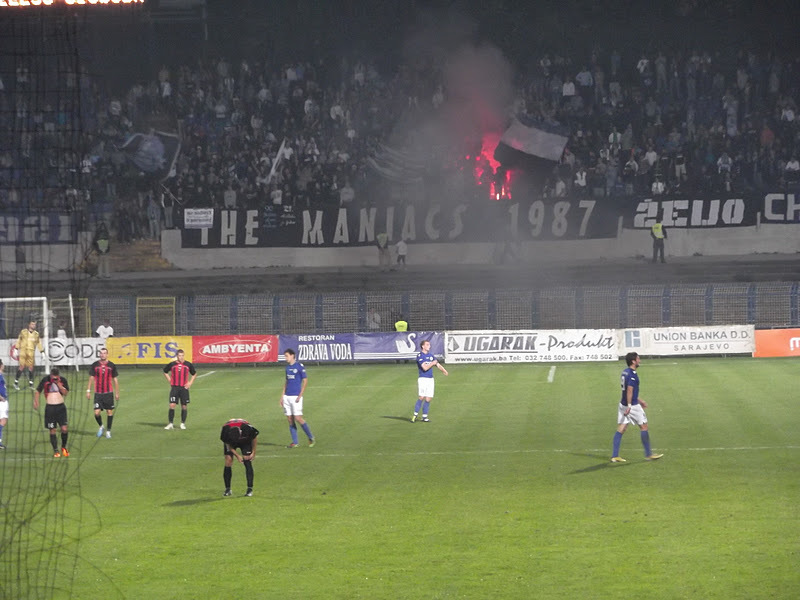 However, after a couple of minutes ‘The Maniacs’ (Željo’s ultras) started to crank things up in the South Stand and remained in fine voice for much of the game. As a contest the game was very one sided with the hosts racing into a 4-0 half-time lead with goals from Vernes Selimović, Zajko Zeba and a brace from Eldin Adilović that would have made former player Edin Džeko proud. With their team easing off in the final stages and no more goals materialising, it was notable how many of the home fans left early. With the best part of 15 minutes to go, significant numbers began making their way out which is something I’ve never seen from supporters of a team winning so handsomely. 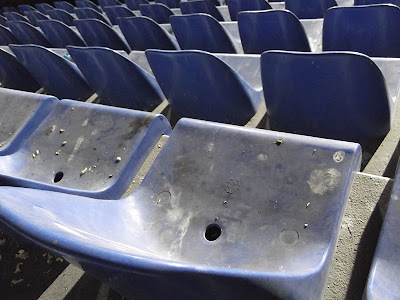 On the final whistle, the wife and I turned round to find a sea of empty seats covered in trouser-protective newspaper as our efforts to blend in as regulars had clearly failed miserably. Consequently we waited for most people to leave before gingerly rising to inspect our clothes - fortunately they hadn’t suffered too much. The crowd was officially listed as 4,500 so the queues for trams were short and the journey home was straightforward. Overall, a visit to Sarajevo is one I would heartily recommend. I had always been very wary of going to a match in the Balkans given the reputations of some of the fans in the region but this was a totally trouble-free experience. The fact that the clubs we saw both came from largely Muslim areas of the country probably had something to do with that – when a Bosnian Serb team come to visit then expect the atmosphere to be less cordial. The city’s derby is supposed to be a great match to attend with the relationship between Sarajevo and Željezničar said to be similar to that of Everton and Liverpool. This season’s matches are in November and May so go if you get the chance. The only drawback to spending a European football weekend in Sarajevo is the fact that there are no direct flights from the UK. To my knowledge, GermanWings are the only budget operator to currently connect the two destinations while a number of national airlines will also do the job (we went with Austrian Airlines). Whichever you choose, it can be done in around four hours which isn’t too bad. Also, don’t let the fact that this is a largely Muslim city put you off. Although there are religious people here, they are in the minority and their approach to Islam is very different to the more conservative areas in certain parts of the Middle East and Asia. Although there isn’t a big drinking culture here, alcohol is readily available in restaurants and bars. 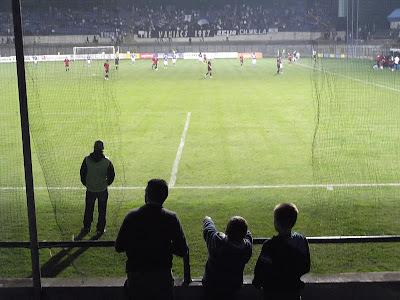 One final tip - I received a lot of very helpful information about going to this match from a young man called Skender who runs tours around Sarajevo and Bosnia. Get in touch with him if you have any questions about watching football here, he’ll be very pleased to help you (http://www.sarajevofunkytours.com/en/contact-and-location.html). James is the brainchild behind the tremendous Non-League Day initiative. Is the locomotive still in the stands of the stadiums? I visited their ground (and FKS) in 2009 when Belgium played in Zenica (quite an experience!) and there was a locomotive in the stands of the Grbavica. German Wings are indeed flying to Sarajevo, from Cologne and probably from other German cities too. Stephane - the locomotive is still there. I took a picture of it to use in this blog but the quality wasn't good enough so left it out. Interesting stuff, apart from the war background and the mosques it reminds me of the Bulgarian matches I've been to.